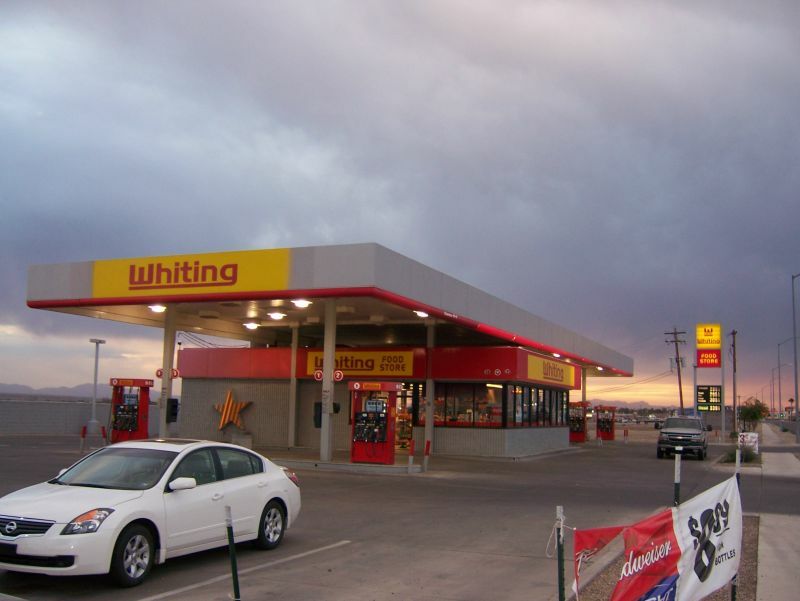 An operating Whiting Bros station on Route 66 in Moriarty, New Mexico. Photo taken June 9, 2014 by John Cirillo. 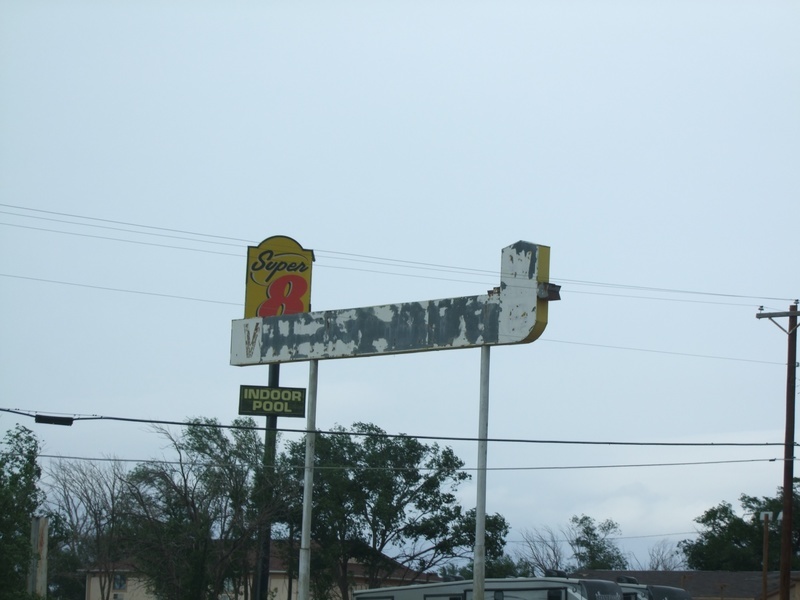 Remnants of a Whiting Bros sign on the east end of Tucumcari, New Mexico. Photo taken June 8, 2014 by John Cirillo. 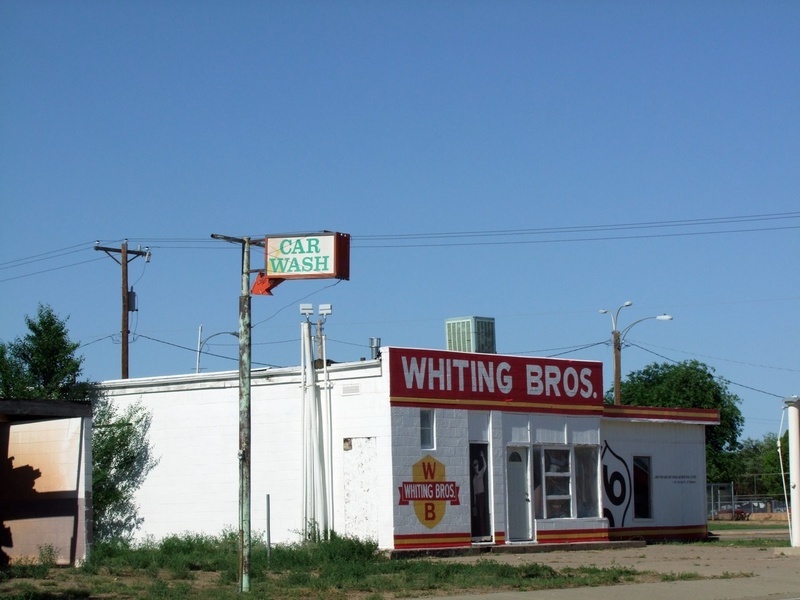 An old station on Route 66 in Tucumcari, New Mexico dressed as a Whiting Bros station. I don't think this ever was actually a Whiting station. Seems to be a decorative project. 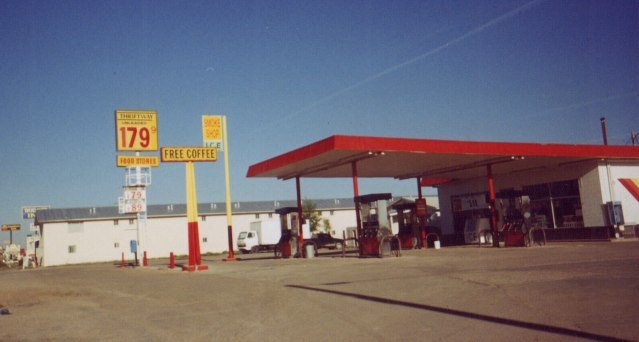 There is also a similar Magnolia, Phillips 66, and Esso station like this in Tucumcari. Photo taken on June 8, 2014 by John Cirillo. 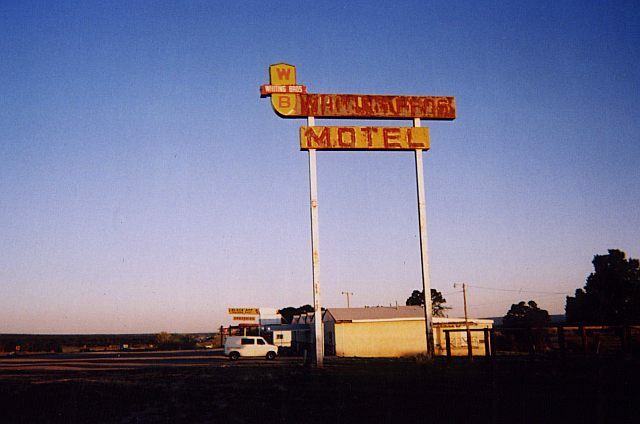 Another view of the mock Whiting Bros station in Tucumcari, New Mexico. Taken on June 9, 2014 by John Cirillo. 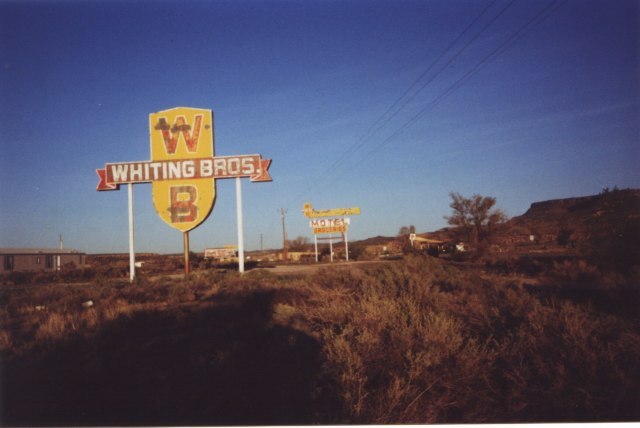 Remaining Whiting Bros sign on Route 66 in New Mexico. Just east of US40 exit 96. 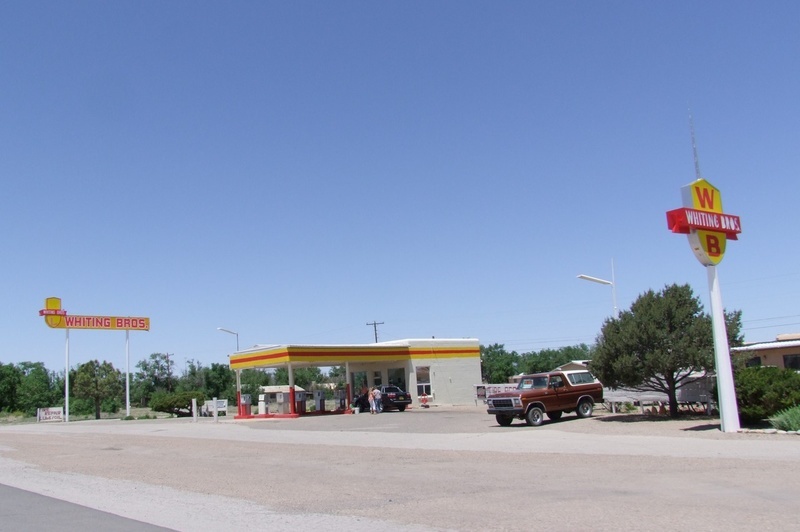 It's the same station in older photos on this page that were described as being 10 miles east of Grants, NM. 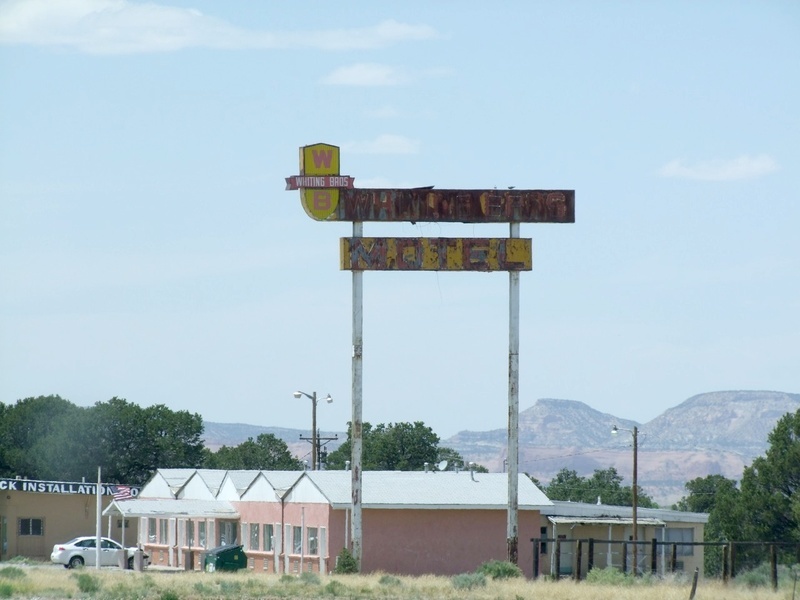 The larger highway sign at the Route 66 and US40 exit 96 location in New Mexico. Taken June 9, 2014 by John Cirillo. 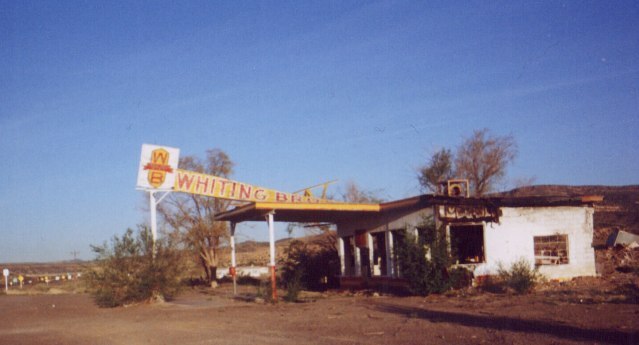 Photo of the Whiting Bros station at the above exit 96 location. No windows, but seems intact. 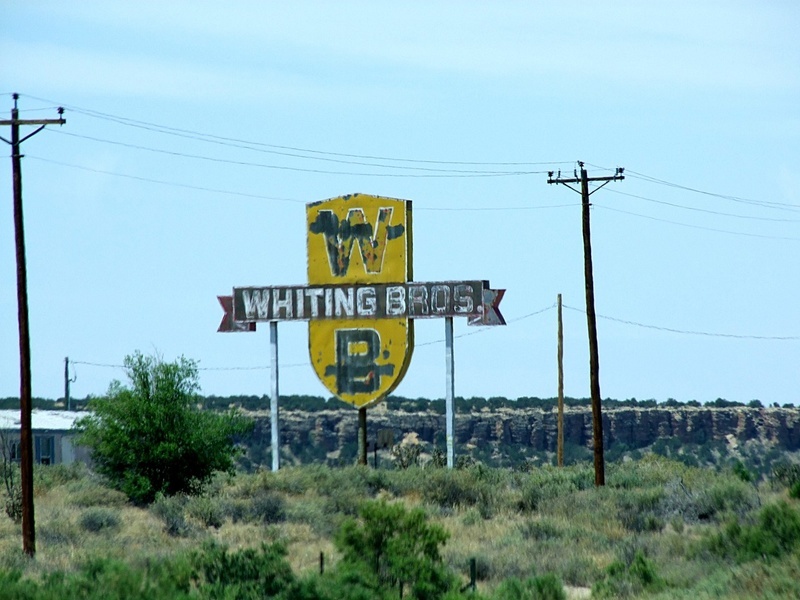 Remains of a Whiting Bros sign at Continental Divide, New Mexico. Location is at US40 exit 47. There is an older picture of this sign farther down this page. Photo taken June 10, 2014 by John Cirillo. 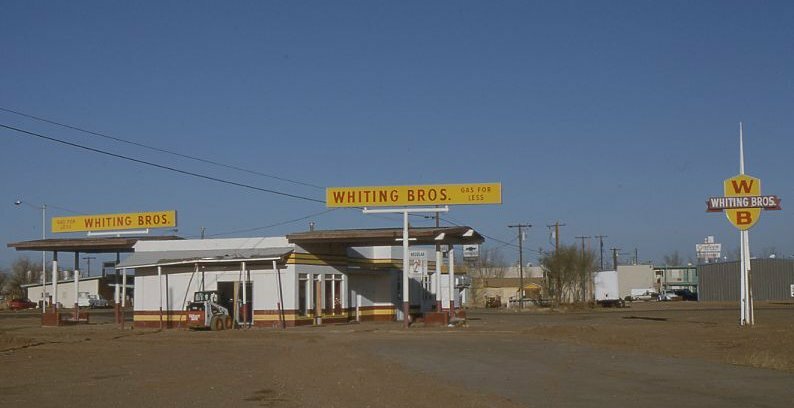 An operating Whiting Bros station in Safford, Arizona. Taken Nov. 16, 2007 by David Aldred. 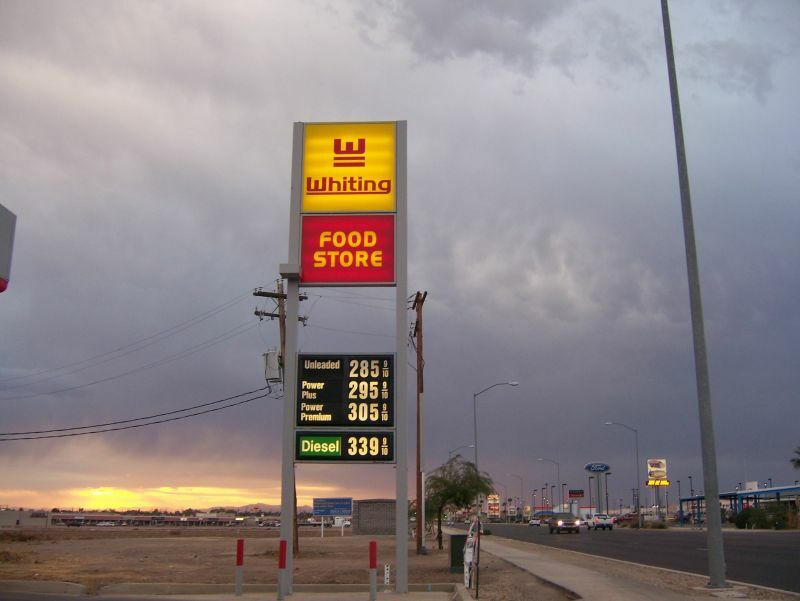 A close-up of the sign at the Safford, AZ location above. 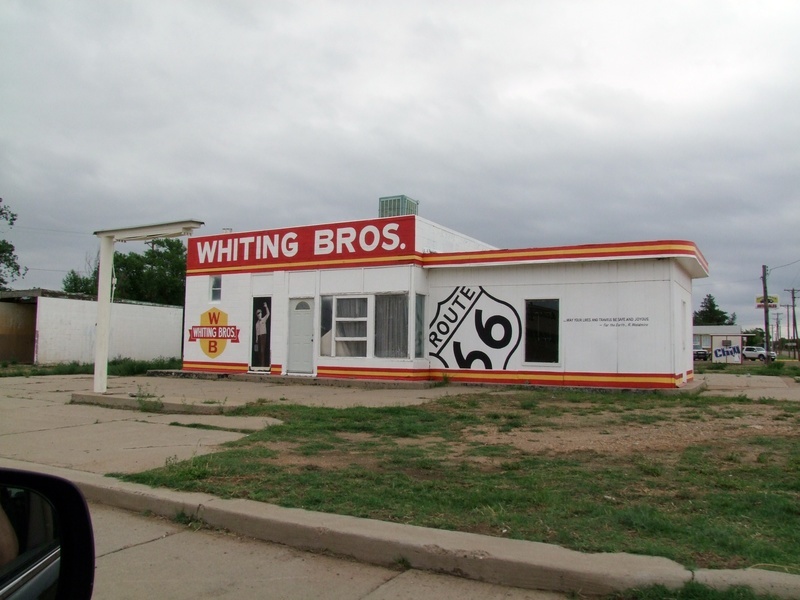 Old Whiting Bros. station on Route 66, ten miles east of Grants, NM. 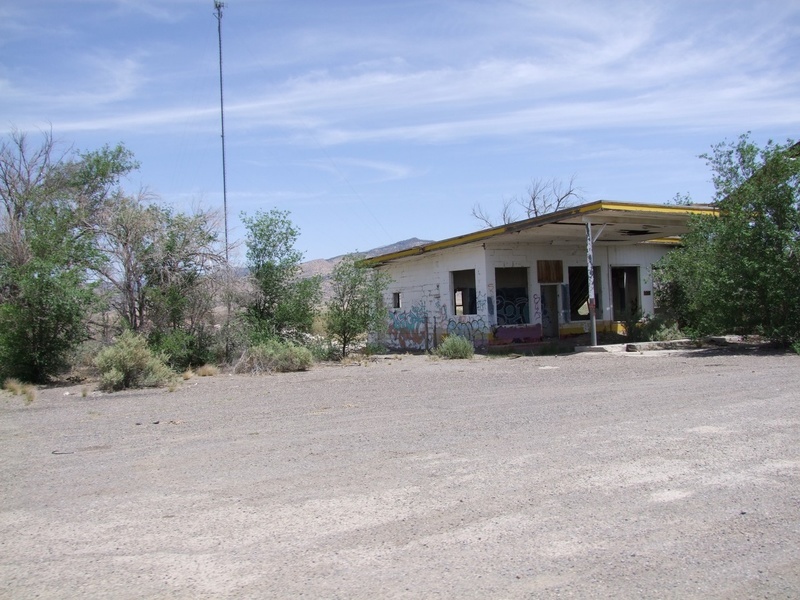 (now gone) and gas station. Note they also sold groceries. 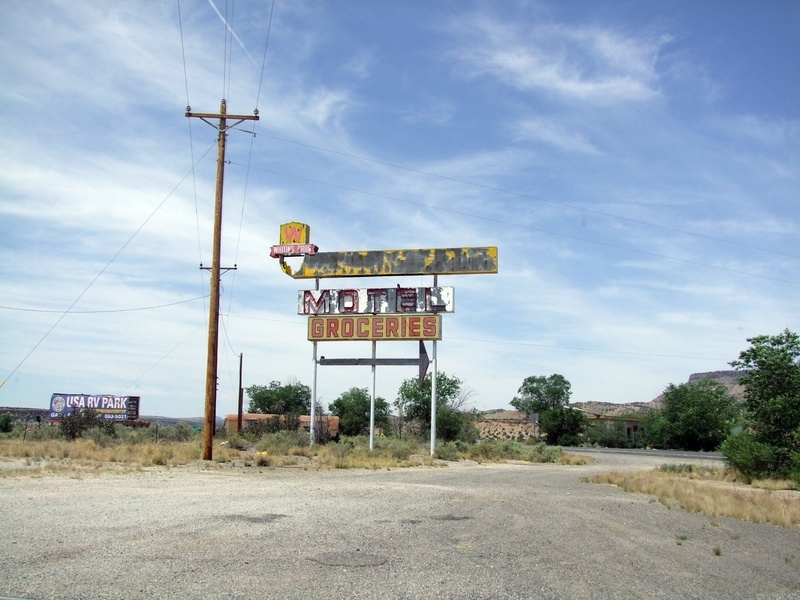 Located on Route 66 (I-40 frontage road) 10 miles east of Grants, NM. Continental Divide, NM. Taken May, 2004 by David Aldred. former Whiting Bros. location. Now converted to Thriftway. On Route 66 in Gallup, NM. Taken May, 2004 by David Aldred. who also operate Giant and Mustang, plus a few other minor brands. These minor brands will eventually become either Giant or Mustang.